Obituary for John P. Shine | Devlin-Rosmos-Kepp F.H. & C. S.
John P. Shine, 79, husband of Carol Ann (Obara) Shine, of Spring City, PA, died on Wednesday, September 12, 2018. Born on August 17, 1939 in Phoenixville, PA, he was the son of the late Francis and Augusta (Benkowski) Shine. John was a loving husband, father, and grandfather. Leaves behind a wife, 2 sons, 1 daughter and a sister Rose, along with 2 grandchildren. 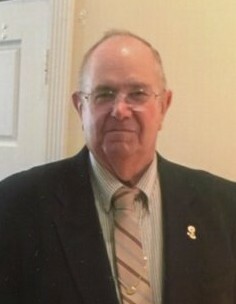 John attended St. Mary's grade school and graduated from Phoenixville High School. Loved his God, Church and always took part singing Hymns at Mass. He did have a good singing voice. Always ready to HELP, SERVE, and DO for others. A quiet man, seldom a complaint. He enjoyed flowers (especially his roses), and his quiet "4 legged buddy, Teddy." A man of many talents! Upon retiring from his job at Phoenixville Hospital, John was an "Ever-Ready" volunteer handyman for whenever and whatever family or friends needed. John was especially a great volunteer for whatever was a need or emergency for the Bernardine Sisters at Holy Trinity Convent for many years! He was an Army Veteran, member of Knights of Columbus, also a Volunteer Fire Fighter for many years with Friendship Fire Company. Sisters, Millie Plunkett and Dorothy Shine. Relatives and friends are invited to attend his Funeral Mass at Holy Trinity Roman Catholic Church, 219 Dayton Street, Phoenixville, PA on Tuesday, September 18, 2018 at 10:00 am with Rev. John Hutter officiating. Burial will follow in Holy Trinity Cemetery. A viewing will be held Tuesday in church from 8:45 am to 9:45 am. In lieu of flowers contributions can be made to Bernardine Franciscan Sisters Motherhouse, 460 Saint Bernardine Street, Reading, PA 19607.